Why do some gardens look so much better in spring than others? Fall preparation! 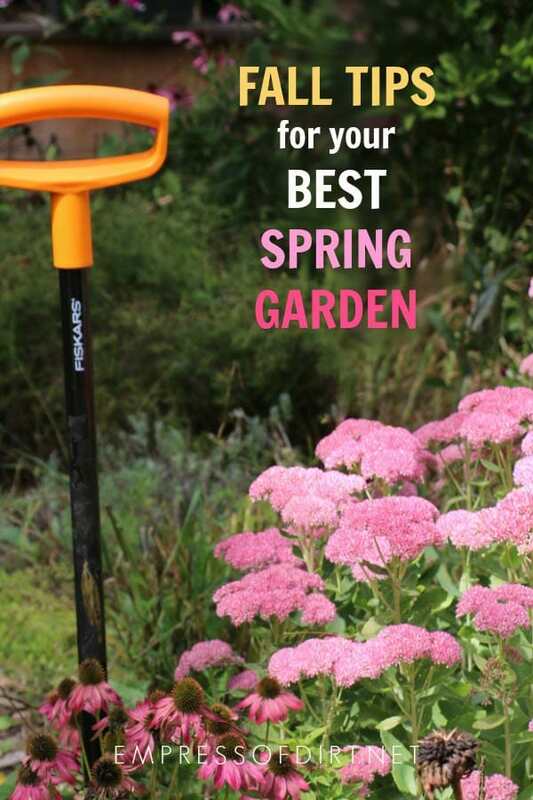 Have a look at what you can do now to give your spring garden a jump-start. Also see, the free, printable Fall Gardening Checklist for more ways to get the autumn garden ready for winter and spring. 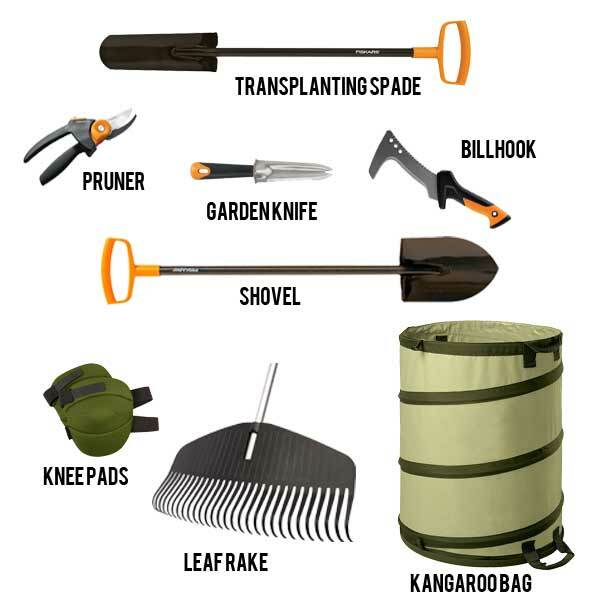 This article is sponsored by Fiskars who also provided sample garden tools including the Billhook and Garden Knife. Content and opinions are entirely my own. Fall is an odd time in the garden, providing both endings and new beginnings. The big show of summer is winding down, yet, as the darker, cooler weather sets in, there are many opportunities for new planting and sowing, veggie growing, and spring preparations. 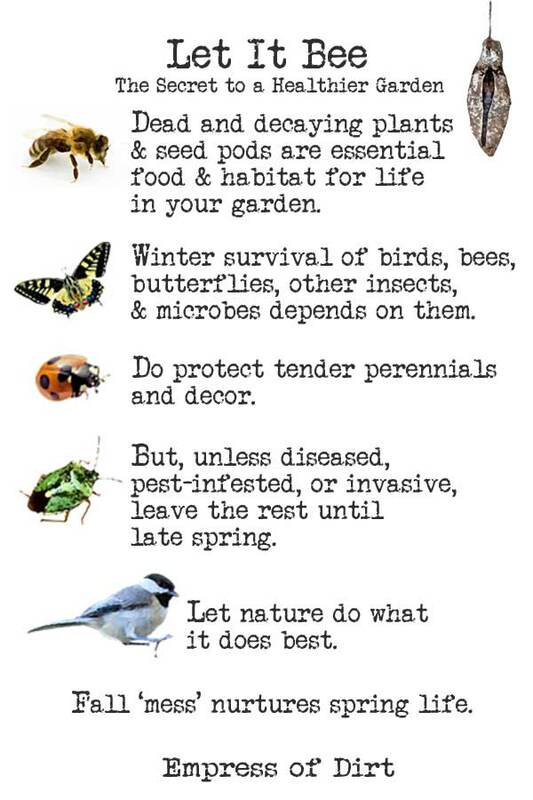 The top item on the task list is to always protect anything that winter might destroy, including garden art and tender perennials. Next, take advantage of the season and get those tasks done that will give your spring garden a jump-start. I’ve provided several ideas below. The right tools make all the difference. Whether I’m doing woodworking, sewing, or gardening, once I find a good tool, I hang onto it, and keep it in good working order to ensure it lasts a long time. Leaf rake | Best feature: leaves don’t get stuck in it! Fall is the time to divide mature, early flowering perennials and transplant them to other parts of your garden. Move them now and you won’t miss out on spring blooms. 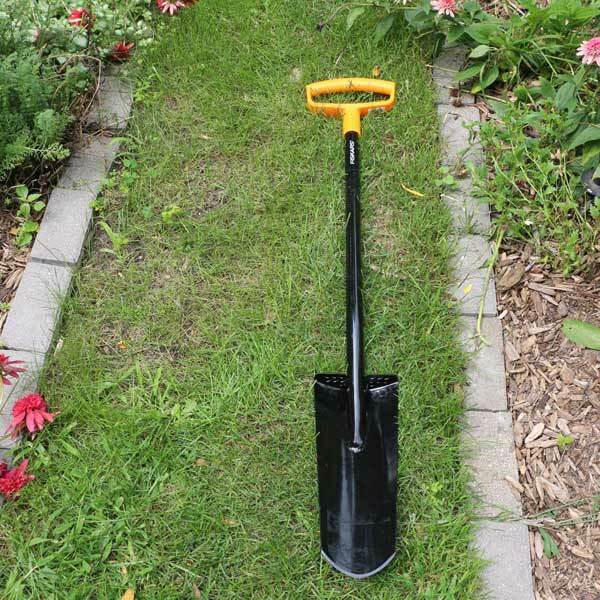 Use a shovel, or better still, a transplanting spade (pictured above). They are narrower and longer than shovels and do an excellent job digging up deep roots. If it blooms in spring or summer, divide and transplant in fall. If it blooms in fall, divide or transplant in spring or summer. The idea is to leave the plant alone when it is budding or blooming so we can enjoy the flowers and fruit. But, the garden police will not come after you if you go off-schedule. It just means you may forgo blooms for one season. Examples of plants to divide and transplant in fall include peonies and astilbe. Ideally, allow six weeks before first frost, so the roots can settle in before the ground freezes. More plant suggestions: 10 Popular Perennials to Divide or Transplant in Fall. Many of our favorite plants are tender pernnials that require extra care to survive the winter months. This list includes some bulbs, tubers, corms, zonal geraniums (Pelargoniums), begonias, and tender herbs including rosemary. Many of these plants can be transitioned to life indoors as houseplants (if you have adequate light and room), or overwintered in semi-dormancy until spring. -Tuberous begonias need winter dormancy. -Cane-type begonias and Rex begonias can be treated as houseplants. Coleus Solenostemon (painted nettle) | Easy to root in water. 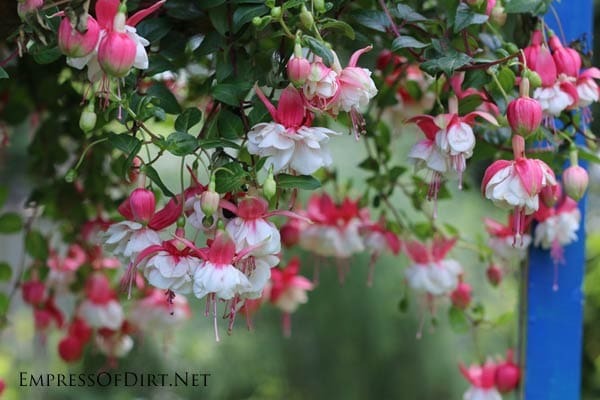 Fuchsia | Keep semi-dormant indoors in a cool, dark location. Zonal geraniums Pelargonium x hortorum | See various overwintering methods here. Tender herbs can be transitioned to life indoors under grow lights. Transition to indoors (as above) or keep semi-dormant 45-55 degrees with artificial lights. If you live in a cold climate, with winter temperatures below freezing, tender bulbs, tubers, and corms should be removed from the ground and stored in a cool, dry, dark location until spring. This includes dahlias, eucomis, cannas, gladioli, tigridia, galtonia, and others. After first frost, when foliage is dying back, dig up from ground careful not to damage bulb or roots. 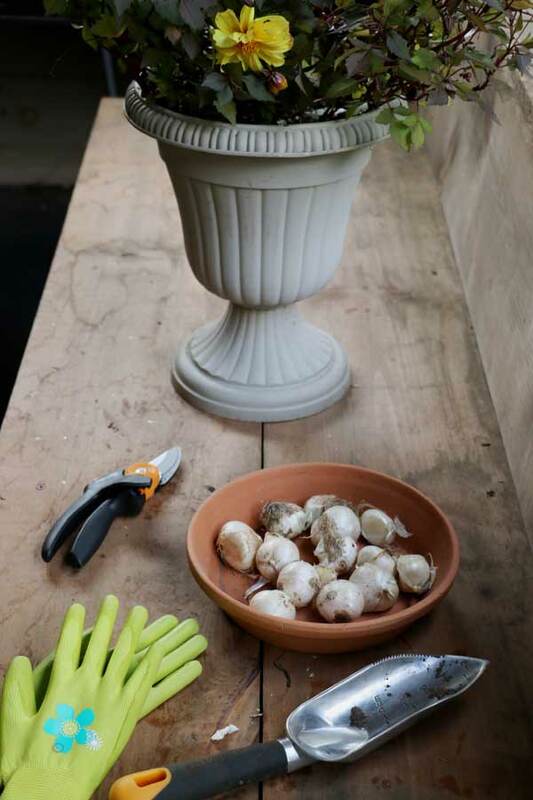 Remove any signs of distress or disease or rotting – cut out bad parts of bulbs and tubers. (optional) Dust with a fungicide if concerned about mildew, rot, or disease. Takes days or weeks, depending on bulb type. Store in cool, dark place above zero. Can be in a box of sand or tray of peat. Add wire mesh to keep mice out. Preferred storage temperatures vary with each bulb type. Fall is the time to sow and grow! There are several opportunities in the cooler weather. a) Quick-growing veggies are ideal for fall growing. You can harvest them after 4-6 weeks or keep them growing through the winter with adequate weather protection.Options include leafy greens, beets, kale, spinach, and more. b) Sow flower seeds that benefit from a winter chill before germinating in spring. 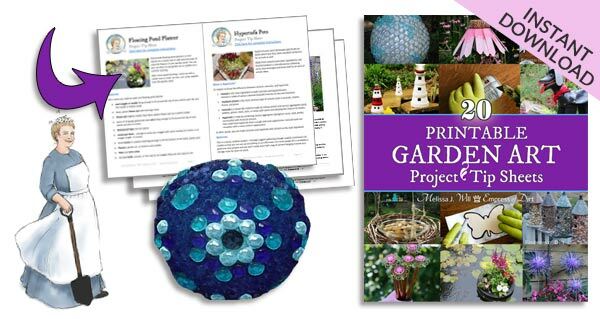 c) Plant bulbs for flowers in spring and summer. When I go on a trip, I love to get the house clean and tidy so it’s lovely when we return home. It’s the same for gardening. Fall is the time to get early spring planting beds ready, so, as soon as conditions are right for seed starting, everything is good to go. It’s nerdy, but worthwhile. Pay it forward for yourself. One big exception is: leave the old perennial growth alone. The winter birds need it for food (seeds) and shelter (early spring nest building). And zillions of insects including butterflies, bees, and countless wee things tuck away in the winter until the weather warms again. 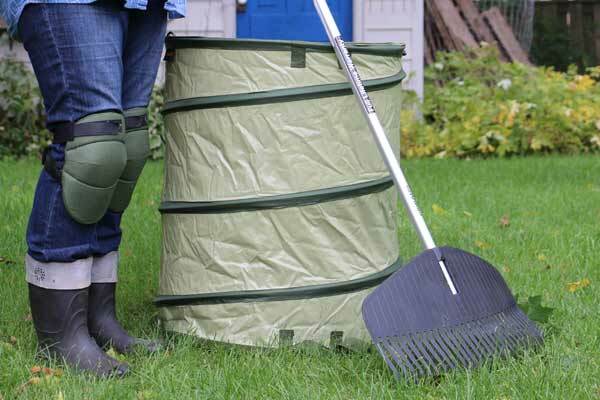 Rake leaves off grass, but don’t get rid of them! This is a good task for a rainy fall day. For tools, if it has blades, nuts, bolts, screws, or chains, it will need maintenance to stay in top condition. Wash, dry, repair, oil, and sharpen garden tools. Store in cool, dry place and you’re all set for spring. Clean garden pots and containers. Empty, wash, bleach (1-part bleach: 9-parts water), dry, and store for winter. Fiskars has tips here for cleaning and sharpening tools. There! Now things are in good shape for spring. Very kind. Thank you, Ardith. Happy fall!